In the context of the lecture series in the History of Architecture for the academic year 2016-2017, Angelos Matthaiou gave a lecture on Thursday, June 8th, on the subject: The stone was found in Stadiou str, in the demolished residence of Amalia, the former bavarian brewer". The Topography of Athens and the 19th century city. 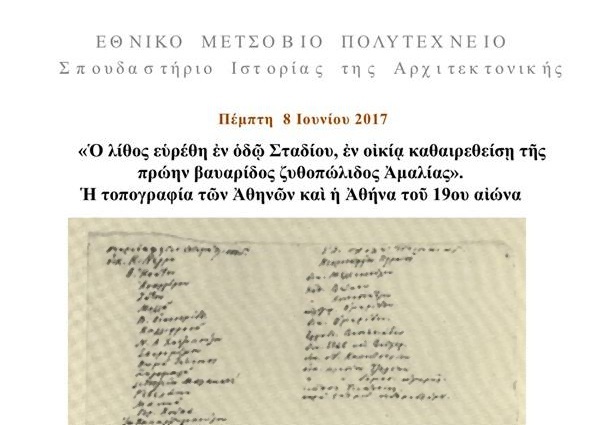 The speaker cited the research question of land owners in 19th century Athens and mentioned, among other things, the need to create a platform where each researcher can submit relevant information, such as property records, in order to gradually link archaeological findspots with actual land plots. The need for a systematic and multifaceted study of the topography of Athens is thus highlighted once more. The presentation by A. Matthaiou is available here (in greek).